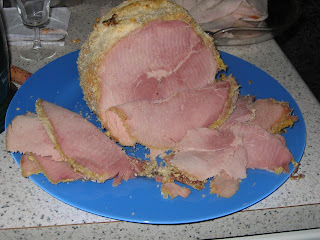 It is finally Christmas Day and this year I've made traditional Swedish Christmas Ham. I ordered it from the butcher's a couple of weeks ago - a cured but uncooked piece of ham - about 4 kg and with all the fatty crackling still on and tied with a string net. There are two ways to cook it - roast or boil and I opted for boiling, as it'll take out some of the saltiness. 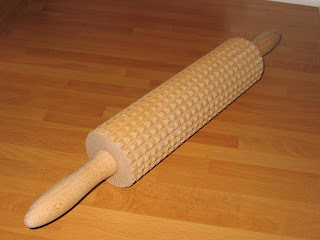 It needs a thorough rinsing with cold water, then pat dry with kitchen towels. Place in a deep enough pot, add a couple of carrots and an onion cut in large chunks, along with a couple of bay leaves and around 25 allspice corns. Though having a sniff at them, they can be replaced by regular pepper corns. 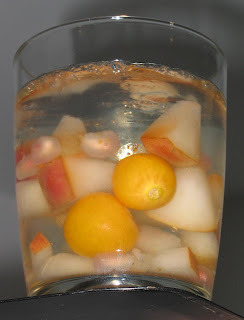 Top up with water to cover the ham, stick a meat thermometer into the thickest part and bring to the boil. Turn down to low heat and leave to boil for about 3.5 hours (generally 1 h per kg ham), the middle of the ham needs to reach at least 73 degrees. Take of the heat when the temperature has been reached, it'll continue to rise for another couple of degrees before going down again. 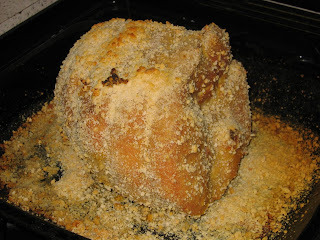 Leave to cool, then take out and remove the crackling, it should come off quite easily. If you want, cut it up and deep fry to get it crunchy. I binned it, it was very slimy I thought. I did this yesterday. I saved the stock too. 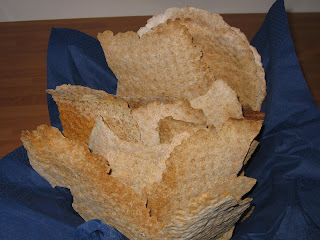 Generally it can be made into what the Swedes call "dopp i grytan" and translates literally into "dip in the cauldron" - and you have a special bread (vörtbröd) to dip in. This bread has lots of spices and raisins in it, making it sweet and it should have a nice contrast to the salty ham stock. I've saved the stock, but won't do the dip this year as I didn't have time to do the bread. Still, it might be nice to freeze in portions for cooking . The yolks, mustard, honey and cornflour are mixed well and brushed generously onto the ham. Then I coated with the bread crumbs and baked for 20 minutes on gas mark 6 (200 degrees C), just to get the bread crumbs golden brown. The ham is served cold generally. 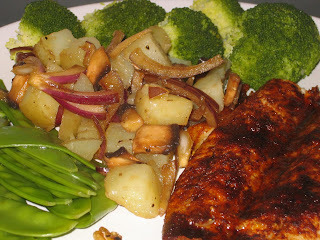 I haven't tasted it yest, as dinner's an hour away, but it looks and smells very nice. Just before serving, it can be decorated with the whole cloves. According to what I've managed to find out, the ham should be big enough to last through every meal between Christmas and New Year. The alternative is roasting which is what my Mum normally does and she uses the roasting bags, to keep it nice and moist. 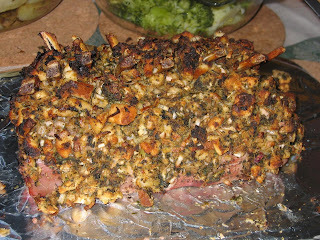 However, the roasted ham tends to be saltier. Again it should be roasted at gas mark 6 (200 degrees C) with a meat thermometer and is ready when it hits 73 degrees. And the decorating procedure is the same. 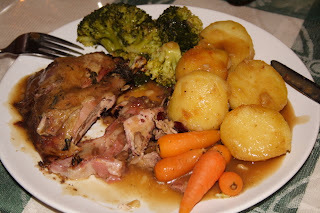 Additional: Well, Christmas dinner is over and I must say the ham was very nice and tender. And we ate quite a lot of it already, the rest will be for sandwiches later tonight, probably with the potato bread I made yesterday. Today I also baked potato bread. This is another recipe from Anne's Food and her contribution to the Daring Bakers, and given how tasty they turned out, I'll try and join them. As Anne, I used my kitchen assistant machine and boy was the dough sticky - I used a combination of sunflower seed oil and flour to be able to work it. And my Mother-in-law's numerous muffin tins. Also I didn't have wholemeal flour, so used granary instead. 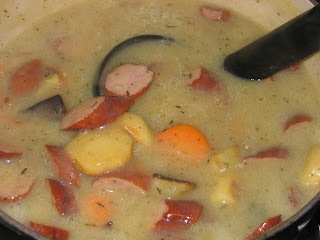 And I left the potatoes to boil over and had to top up the liquid with some tap water. And I still have not succeeded in finding fresh yeast, so used my quick yeast that I use for my bread machine. The dough rose ever so well, I had to push it down twice during the first 2 hour rise phase. And I got to use up most of the 4 egg yolks I had left over from the glue icing I made yesterday for the gingerbread house. This year we had a proper whole day of Christmas preparations - I got a new book on making gingerbread houses and the nieces got to select a design. 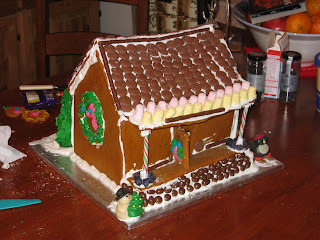 Wisely they chose the "basic house", which turned out to be a lot more complicated than anything I've ever done before. 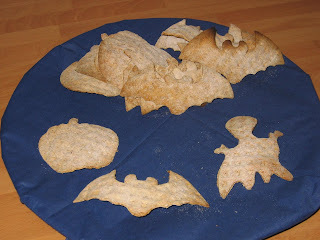 But we made the patterns from cardboard, the girls rolled the dough and cut out the pieces. We did make the larger parts thicker and had to bake them for 20 minutes. Also I forgot one of the house sides and we had to make it once we were half way through putting the house together. Besides the glue icing was quite runny, so we had to support the bits while it was drying. We didn't really wait long enough before beginning the decorations and I think that contributed to the house going way crooked. Still, we all had lots of fun and ate far too much coloured icing. I'm particularly proud of the spruces the kids made from ice cream cones. Ever since Lundulph and I moved together, we've had a different bird for our romantic Christmas dinner for two. Our first Christmas we had goose as per old English tradition. I bought a frozen one, it cost £20. Thawed it and followed Delia Smith's recipe, despite the gut feeling we both had that it wouldn't work - even after I'd managed to hunt down the Armagnac that was required. I made Lundulph do the actual stuffing, it seemed too iffy for me. We didn't tie the goose either - it stretched out in the oven and we struggled to get it out in the end. And from the rather big bird that we put in, what came out was more of a pigeon size - during the roasting we'd gathered up about 2.5 pints of goose fat. Don't remember much of what goose flesh tastes like. But the stuffing was a traumatic experience and since then I have severe doubts about Delia's capabilities as a cook. The only good thing that came out of this is discovering that goose fat is the ultimate thing for roast potatoes. Luckily Sainsbury's sell that in cans and I buy one every year for Christmas. And it's picking up in popularity too, it's easier to find these days. This is what we settled on last minute two weeks ago, after discussing other game birds and their status in the UK in terms of how threatened they are. It's also from my new thing of going to the butcher's. And it seems that pheasant is en vogue this year, they had loads. I also ordered a cured uncooked ham for Christmas Day. 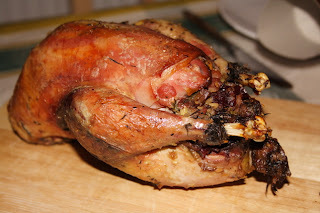 A quick search on pheasant recipes of the roasted type didn't result in anything inspiring, so I defaulted to look at Delia's website, where two recipes seemed interesting - "roast pheasant with chestnut stuffing and port and chestnut sauce" and "pheasant roasted in butter muslin". I couldn't decide on which of the two, so picked bits from both and invented as I went along. As Delia recommends, I wiped the bird with kitchen towels, also the cavity, there was some blood that came out, when I unwrapped the pheasant. Also it seemed to smell a bit funny, so I had some doubts. Then I gave it a good massage on the breast to loosen the skin, just like Fanny Cradock. This was a rather surreal experience, but I managed to slide my hand entirely under the skin in the end. So I stuffed the bacon rashes along the breast under the skin. For the stuffing, I peeled and diced the shallots, diced the bacon and fried them in the butter for a few minutes and left to cool. 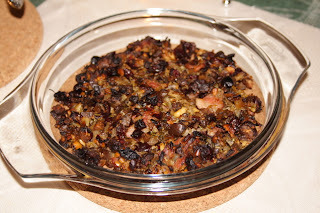 Once the shallots and bacon were cool, I added the chestnuts, pine nuts, cranberries, parsley and thyme and seasoned with salt and pepper and stirred well. Then I bruised the two bay leaves, but not too much so they'd come apart. I stuffed one in the cavity, then half filled with the stuffing mixture, then the second bay leaf, then as much stuffing as would go in. And to be on the safe side, I tied the legs and tail together. I then put a tsp of plain flour in my roasting bag and shook it about, this was recommended on the packaging. 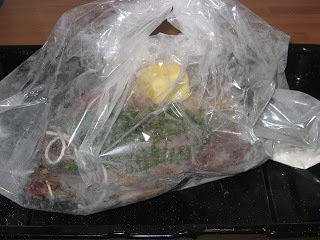 I placed the pheasant in the bag, seasoned with salt and pepper, placed a bay leaf and 3 sprigs of thyme on it, and a knob of butter on top, tied it in and put in the oven (preheated at gas mark 7 (220 degrees C) on the lowest shelf. I used a roasting tray for this, but without the grid. I had some stuffing left over, so I put it in a shallow oven safe dish and put it the oven as well. 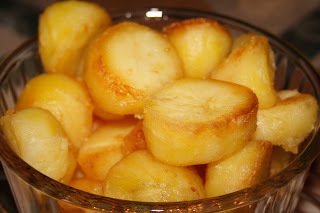 For the roast potatoes, I peeled and cut the potatoes in chunks, as they were quite big. Then I boiled them for 7-8 minutes, drained the water, and shook them around in the pot with the lid on. This rips up the surface of the potatoes and is the bit that'll soak up fat and become crispy, so it's a vital step. I put a deep roasting tin onto the hob (make sure it can take it!) and poured out most of the goose fat of the tin and heated up. Once it was hot, I transferred the potatoes to the tin and rolled them around to get them coated with fat, then put on the top shelf of my combined grill and oven. I've never had good experiences using it as an oven before, but on maximum 8 it did the trick. I took out the potatoes a couple of times during the roasting and basted with the goose fat and also turned them around a bit. I completely forgot to time the pheasant, I think it was in for about 40 minutes by the time I decided it was ready and took it out. I cut the top of the roasting bag and took out the bird, put the roasting grid back onto the roasting tray and put the bird on that and back in the oven to give it a bit more colour. I cut a small hole in one of the bottom corners of the roasting bag and poured out the juices into my non-stick wok pan and put it to boil. I put in one tbsp of plain flour and stirred in, then as soon as it got thick I added the Madeira. Sadly it went rather lumpy and mostly it stuck to the whisk, so I slowly added a second tbsp to make up for it. I added the stock, still stirring and wondering if I should sieve it or not. Decided against it in the end and added the chestnuts and left to simmer for a few minutes. In addition I also steamed Chantenay carrots and broccoli. All in all, I must say, it turned out rather well, the pheasant was very tasty, not at all extreme in any way, so I'm guessing it was a young bird. It wasn't dry either, thanks to all the bacon and the roasting bag. The cranberries were a bit too sweet, especially combined with the sweet Madeira sauce, but the flavours mixed rather well together. As accompaniment we had a Californian Zinfandel from 2005, which worked quite nicely. Due to all other things we still had to do, and general lack of imagination, I bought a ready made chilled dessert, which was very nice - some sort of chocolate pudding with gooey chocolate sauce and it came in small ceramic ramekins. 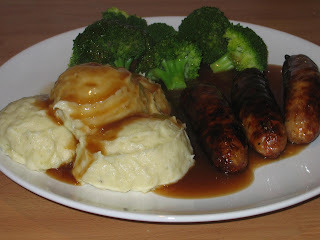 I microwaved them to get the sauce bubbly and served with clotted cream ice cream. Yummy! Lundulph was so hungry, he tucked in before taking a photo. 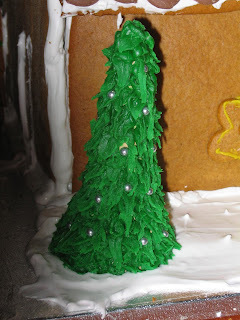 Right, now back to the kitchen to mix up some dough for the gingerbread house, that's tomorrow's project and this year the nieces have selected a new and complicated design. Last week, after many years of consideration, I've bought myself an asparagus kettle and tonight I tried it out. I still managed to over-cook the asparagus a bit, but still it was very nice. 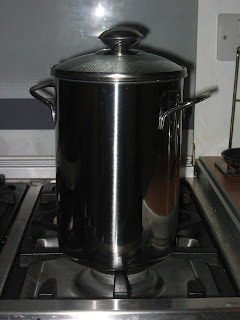 The kettle consists of a narrow, but tall pot with a wire basket. The idea is to place the asparagus standing up in the basket, with the tips above the water edge. That way, both the stems and the tips should be ready at the same time. 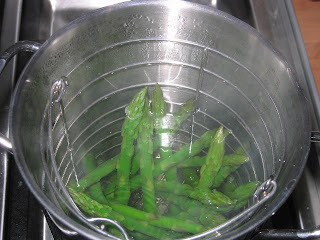 This I worked out and will try next time, as I left the basket in the pot while bringing the water to boil and then dropped the asparagus in and it went through the holes on the sides. What I should have done is to place the asparagus stems in the basket, place the basket in the pot and measure up water to be below the tips. Then take the basket out, bring the water to boil and put the basket back in for 3 - 4 minutes, depending on how thick the stems are. 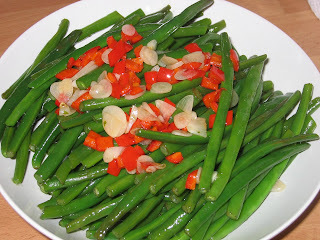 I quite like to dip the asparagus in Hollandaise sauce, but I didn't have any today, so improvised the following, based on what we'd had at Fred & Ginger's some time ago. I roasted the pine nuts in a dry pan for a couple of minutes, stirring vigorously to avoid burning them. 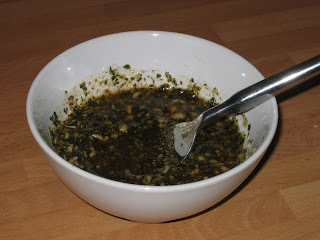 As soon as sizzling noises started and the pine nuts looked sweaty, I transferred them to the mortar and pestle and ground them very coarsley - a couple of minutes, then I got tired. In a bowl, I mixed all the ingredients, at which point the asparagus was ready. Not as tasty as Fred and Ginger's, but quite nice on the whole. And since I started cooking Indian food, I always keep chopped parsley in the freezer. Note to self, get fresh mint for chopping and freezing. Yesterday we had Lundulph's parents over for the day and spent most of it Christmas shopping. Lundulph's Dad and Lundulph himself like lamb a lot, so I thought I'd make a roast. 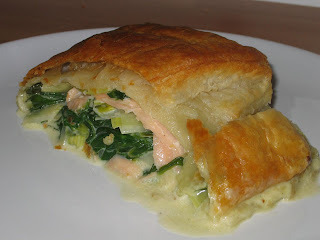 But then I came across this recipe from Waitrose and it just looked too delicious to ignore. I've also started going to our local butcher's, which is very exciting, so got the lamb rack from there - I asked for one of 600 g as per the recipe, and the butcher did comply, I explained how I was planing to cook it and he started preparing it, confirming that what I wanted was a French cut. He also cut the rack in two and put it so the ribs crossed and tied it with a string and said I could put some filling inbetween. But the rack was rather small - 7 ribs all in all. 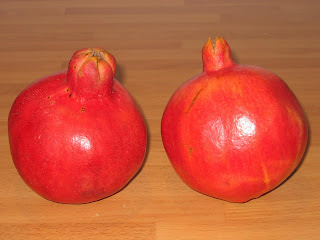 So I still bought another two from Waitrose - theirs are a lot smaller and all fat was trimmed off. They also cost more than twice as much as the rack from the butcher's. So I doubled the crumb mixture also was in a bit of a rush and didn't get it mixed through very well. I covered all the lamb racks and left in the fridge while we were at the shops. That was also "chef's tip" on the recipe card. Finally the timings for roasting were not right the recipe said 35 - 45 minutes and the Waitrose rack packets said 15 - 25 minutes. I started with the butcher's rack first as it was bigger and roasted it for 15 minutes, then put in the Waitrose racks as well and roasted for another 20 minutes. I checked with a thermometer - the racks had reached 55 degrees C. I left them in for another 15 minutes, then switched off the oven while we were having our starter. Still when I served the lamb, the chops were nicely pink. Throughout the roasting, there were the most wonderful smells coming out from the kitchen. And despite that the crust hadn't been mixed up well, it was ever so tasty. 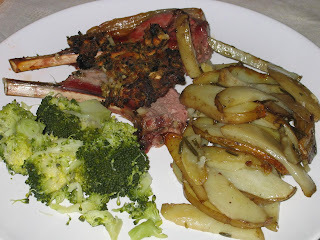 Along with the lamb I made rosemary and garlic potato wedges, which also went down a treat. I used waxy salad potatoes and cut in wedges. Then I steamed them for about 7 minutes. In the mean time, I poured grapeseed oil in a pan and pressed three cloves of garlic into it and also chopped some fresh rosemary and mixed in. When the potatoes were done, I transferred them carefully into the pan and stirred them in to get them coated with the oil, then baked for 40 minutes, stirring a bit half way through. I left them in the oven while the lamb was roasting. For greens I steamed some broccoli. During carving, though, the crust fell off, sadly. Not sure how they did it on the recipe photo. It might seem that I've not done anything for a while and partly it's true, but I did bake the other day, a tad too early for St Lucia, but I had a hankering for the lovely saffron buns and it was the first Advent Sunday. This is the same recipe I used last year. 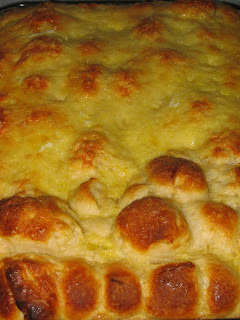 Once again I used too much flour and the dough was too hard. Also Lundulph was making a curry at the same time and had opened all windows to get the steam out, so it may have been a bit too cold for the dough to rise as well. At the time of kneading and rolling I noticed that it was very tough and kept pulling back, so the little buns were difficult to make. Also I'd forgotten to buy eggs for glazing, I always do that when the dough doesn't contain eggs itself. So I had in the back of my mind that apricot jam could be used. Funnily enough I had some apricot jam at home, since I used some for the dammsugare. As you can see it looks OK-ish, the buns were very glittery when I took them out of the oven and are quite sticky to touch. 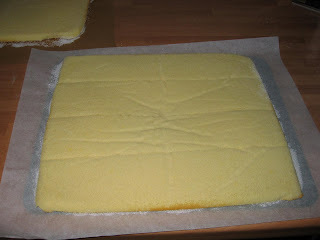 But mainly I really need to make a softer dough, possibly add a bit more sugar. 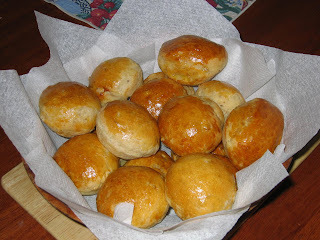 The buns should be good hot and cold and these are only good hot. Too hard to eat cold. 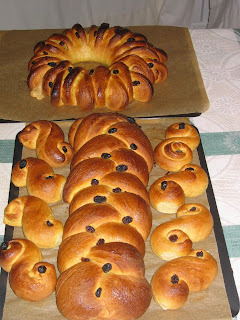 I'm beginning to rationalise things a bit like my Mum too, as I couldn't be bothered with making the small buns and did two wreaths (using up a packet of marzipan I bought some weeks ago by mistake) and a plait. It all freezes very well though, we'll be having these well into February next year, I bet. Finally Lundulph and I managed to get our acts together and have a dinner party. I've been wanting to do this for ages, but there have been so many other things to sort out. Tonight was Bulgarian night and I had made Shopska salad for starter. This is a fairly regular salad with tomatoes, cucumber and lettuce with grated feta cheese on top. I added roast peppers and radishes to that. Traditionally it should have onions and coarsely chopped parsley. This is not really suitable for the season, but I couldn't think of a more Wintery starter. The main course was my moussaka, made in the small colourful terracotta pots. That went down very well indeed. And for dessert, I made the following dessert, which I don't remember the original name of. If not already smooth, put the jam in a deep container and blend until completely smooth. It should be slightly runny. 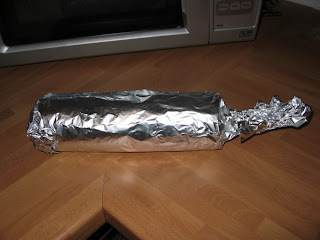 Tear off a piece of aluminium foil, large enough to wrap the packet of biscuits completely and place on the work surface. Take out all the biscuits, discarding any broken ones. With a knife or spatula, spread a little jam on one side of a biscuit and place somewhere on the aluminium foil. The layer should be half the thickness of the biscuit itself, don't be stingy. 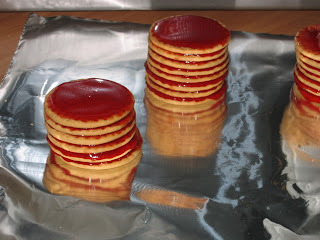 Take another biscuit and spread jam on one side as before, then place with the dry side on top of the previous biscuit. Repeat with the rest of the packet, save one biscuit. Note that after you've stacked about 10 of them, the tower will be a bit unstable, so I suggest you start on a new stack. Now comes the sticky part. Take each stack and lay down one next to the other, so that a long sausage forms. Place the last dry biscuit at the end that has jam on it, then quickly rinse your hands and roll up the aluminium foil, making sure the biscuits stay in place and close to each other. 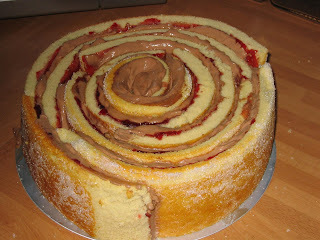 There may be need to give the whole thing a squeeze at the ends, then also make sure to roll it between your fingers to make the jam go back between the biscuits, as it'll run down one side once you start putting it together. Put standing up in the fridge overnight. When ready to serve, unroll the aluminium foil and with a sharp large knife cut through at an angle to get stripey slices. I served with dairy ice cream and it worked rather nicely. This holds rather well for days. The dry biscuits will soak up quite a bit of the jam and the whole thing should become fairly solid and easy to cut. Of course other jams will work just as well, but they should be of a strong colour so that the stripes come out. Well, the preparations of the previous days culminated in a big party yesterday and it went on well into the night and today. 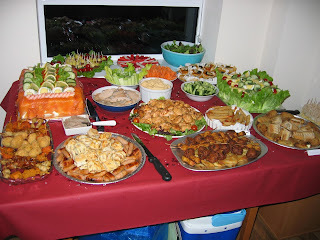 I managed to get a snap of the table before too many guests had arrived. 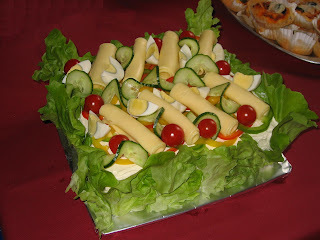 The Friday was the last day for preparations and was entirely dedicated to the pièce de résistance, a Swedish smörgåstårta or sandwich cake. 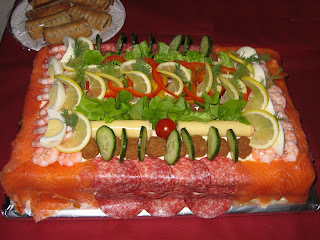 This is the standard Swedish party food and is very good when a large number of people are invited. It's fairly easy to make and looks very impressive. Everyone has their own recipe, the following one is one that my Mum has developed over the years and I don't think I've changed it that much. Also it represents what I most like about my Mum's recipes - you can stop at some point and it's ready, or you can continue to add things to it to turn it into a different dish. In fact it epitomises this concept. I made two - one larger one for the meat eaters and one smaller one for the vegetarians. I also ended up with some of the creamy stuff to spare, it would have been enough for two large cakes. Open the carrots and peas and leave to drain well. Whip the cream, ignoring that it says it's not for whipping on the packet, it works just fine, but be careful not to over-do it, very easily done. Combine the yogurt, crème fraîche, the whipped cream and the mayonnaise. Add salt and pepper to taste. Set aside one third of this mixture and put in the fridge. Cut the chives and dill with scissors into the creamy mixture. Chop the carrots to pieces of approximately the same size as the peas. 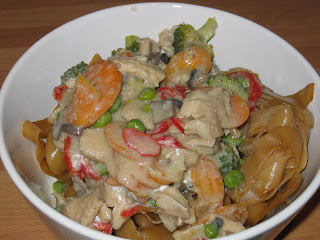 Add carrots and peas into the creamy mixture and stir in well and leave for an hour to allow the flavours to blend. In the mean time, if you don't have a cake board, cover a large chopping board with aluminium foil and sello tape it on the back. Make sure to have the matt side up. Now, take two slices of bread at a time and with a sharp knife, cut off the crusts, as close as possible. 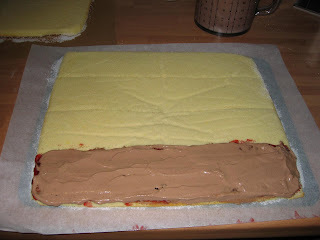 Lay out one layer of bread on the cake board, so there are about 3 cm on either side to spare. The slices should be close together, any gaps should be filled with suitably cut pieces of bread. 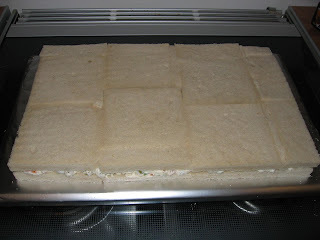 Take some of the carrot and pea cream and spread on top as evenly as possible, making sure to cover up to the edges. Lay a second layer of bread on top, making sure that the edges do not coincide with the ones of the bottom row or the cake may split. 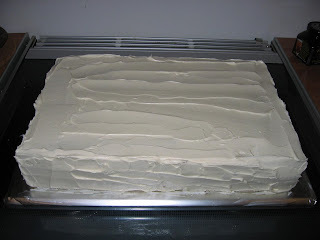 Cover with another layer of the carrot and pea cream. Repeat with another layer of bread and cream and finish with a fourth layer of bread. Now take out the smooth cream from the fridge and cover the top layer of bread fairly generously and also cover the sides, to hide the layers of bread. Make sure to have a little left over from the smooth cream. Wipe off any spillage along the edges, this is where the matt side of the aluminium foil is handy, as it won't be as obvious as if wiping the shiny side. At this point it should be put in the fridge for a few hours, preferably over night. 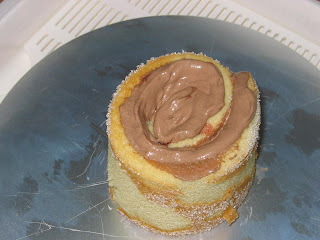 The next day, take out the cake and inspect it, to make sure that parts of the cream haven't been absorbed to the extent that the bread is visible. If this is the case, use the left over to touch it up. Also this is the state it should be transported in, if necessary, again the extra smooth cream can be used for repairs at the destination. 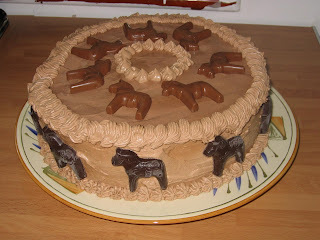 Decorate as close to the beginning of the party as possible, particularly if there is no fridge to store the cake in. And here it's entirely your imagination that sets the limits. Here is what I did yesterday afternoon for the party, but every time it's different. You may possibly recognise the creamy stuff from before, it's pretty much the recipe for white sauce, but with some yoghurt added as well, to make it a bit lighter. In fact, all of the ingredients can be "light" or "diet" varieties, apart from the yoghurt, which must be full fat and strained, or it'll be too runny and the bread will go soggy. As for the peas and carrots, in Sweden you can get them ready mixed in cans, with the carrots suitably diced, but I couldn't find any, so had do get them separate. Again, draining is vital. But you can use other things instead, like canned diced mushrooms or diced cooked ham. 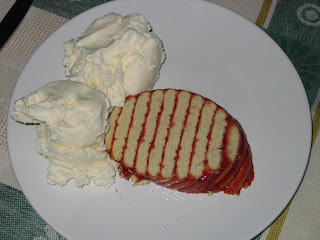 In addition to adding interest in flavour and texture, they serve the purpose of preventing the cake sinking in at places, should the bread soak up the cream at different rates. Also what struck me the other night is that if you add mushrooms and ham and boiled potatoes (all diced) to the creamy mixture, you'll pretty much end up with a Russian salad, as it is done in Bulgaria. I was lucky in that the cakes hadn't sunk in anywhere and didn't need much repairing after the transport, so the leftover smooth cream went in a bowl to be used as a dip. On Thursday I had a bit of a rest night, in that all I made was a large number of kisses, this time also with walnut halves. 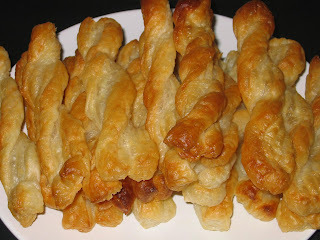 I think they were the main hit of all my dishes at the party, so difficult to stop eating them. This time I followed my comments on the original blog entry and used 1 part egg whites with 2 parts icing suger per weight, but this didn't work out well at all, in fact the mixture went runnier than it was originally. I tried to compensate by adding a couple of table spoons corn starch, but it made no difference to the consistency. So piping was also difficult and I put fairly small blobs on each nut half. Baking went fine, but the meringues went beige coloured, I suspect because of the corn starch. So further experimentation is in order. Either way, the kisses disappeared very quickly. On the Wednesday, I made pizza rolls. This is the same principle as with the cinnamon buns, but is done on a pizza instead. I made the pizza base in the bread machine and I made two lots - one with meat and one without. Sadly the first lot was way too soft and the rolling was quite tricky and cutting the twirls was even more so and messy too. For the second lot I used a very generous amount of additional flour and worked a bit better, but I took too long to do the whole process and it went soggy and just as messy. Once in the oven though, things sorted themselves out. Next time I think I'll try the much stiffer wholemeal base instead, it should make things a lot simpler. So the trick is to make the tomato sauce very very think. I used 2 cans of tomatoes and drained them, to speed up things a bit. 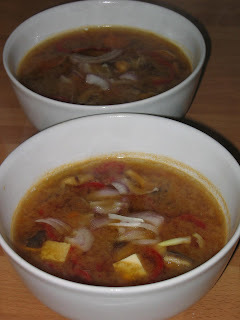 The onions were chopped very finely and I also sliced some canned mushrooms and added to the sauce, again well drained. The cooker was quite orange from all the spluttering, but the sauce was as thick as a paste. 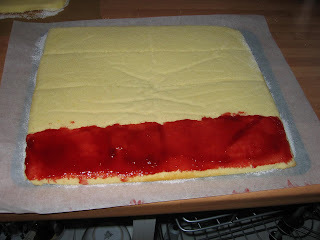 Then I rolled the dough into a rectangle and spread the paste apart from a 10 cm wide strip along one of the longer sides, which would end up as the outer edge of the roll. For the meaty pizza I cut pepperoni into small pieces and added some capers before rolling it and slicing. 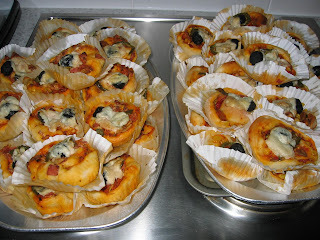 Each twirl was then placed in fairy cake paper forms, decorated with a slice of jalapeno, an olive and a thin piece of parmesan and baked at gas mark 6 (220 degrees C) until it got a nice colour. For the vegetarian ones, I used sweet corn and pickled roasted pepper strips, but with the same decoration. 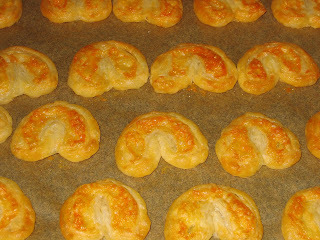 They didn't look as pretty as I'd hoped for, but worked quite well and were very moorish. 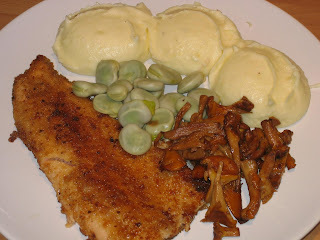 On the whole, I should also have cut the mushrooms smaller too. And the paper forms were not very good either - they soaked up a lot of grease, some of it orange tinged from the tomato sauce and it didn't look nice at all. Perhaps I'll try without them next time. It may appear as we haven't eaten this month, but in fact, I've been so busy cooking this past week, that I haven't had time to update the blog. That and the possibility that Lundulph's Mum might have a peek and spoil some of the surprise. Lundulph's parents celebrated their 40th wedding anniversary this week-end and so a party was called for, a party with lots of food. I made a very precise schedule, which I managed to follow precisely. 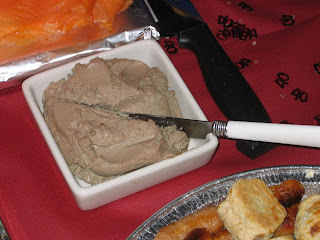 On the Tuesday I made hummus and chicken liver paté, having never made either before. But I'd planned on trying the hummus ages ago and had a jar of tahini in the larder. The recipe is one that I'd written down on a small piece of paper, so have no idea where I got it from. I have done this for many years and have a large batch of post-it notes and shopping receipts whith recipes scribbled down at the back. Put the chick peas and 120 ml of their liquid in a blender along with the rest of the ingredients and blend until smooth. That's all there's to it. On the whole, I think I used a bit too much tahini and not enough olive oil, it felt a bit dry. Also it's a good idea to leave the hummus over night, to allow the flavours to develop. Very nice to dip, that's for sure. The second thing I did that evening was chicken liver paté, mainly inspired by Fred & Ginger who had made some for us the other week. I had a recipe from Waitrose from ages ago, that seemed simple enough. The only thing I forgot to get was the muscat wine, so I used a syrah rose instead. Very intrigueing this paté thing, when it was ready in the blender, it had the consistency of chocolate mousse, but tasted of liver. I transferred it to a box and put it in the fridge, hoping that it would go a bit solid at least. 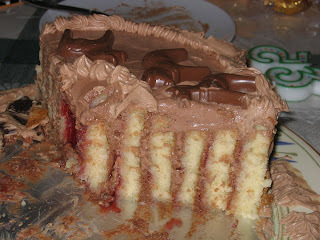 And it did - it was really good and had the nice smooth texture that you'd expect too and tasted lovely. It went particularly well together with the knäckebröd I made recently.